The RK12E Erie is a freestanding tub that allows the caregiver 360º unobstructed access when bathing a resident. The low threshold and wide side-entry door allows easy access for residents with various degrees of mobility and the built-in contoured seat allows the resident to sit comfortably and safely in a slightly reclined position. The valves can be positioned in 2 different places; One placement is on the side for the RK12ESP and the second placement is on the front for the RK12EFP. Designed to create the atmosphere of a luxury spa, the sleek exterior design of the RK12E Erie will give your bathing area an upscale look. Caregivers will enjoy the RK12E Erie for its ease of use and the improved quality of care they can provide the resident. 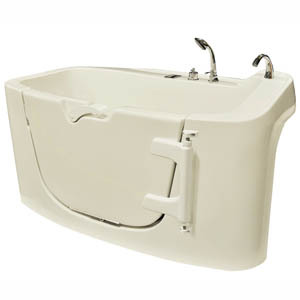 Featuring a full range of standard and optional features, the RK12 Erie is designed to enhance the bathing experience for the resident. Thermostatic Mixing Valve with anti-scald protection that dispenses up to 16 gallons per minute for fast tub fill. 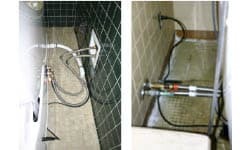 Handheld Shower Wand for hair and upper body washing, which can be used at the same time the tub is filling. Digital Thermometer for monitoring water temperature within bathing system. 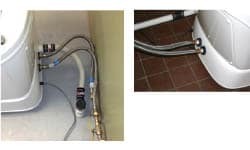 3/4” Supply Lines constructed of stainless steel. 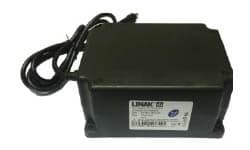 Secured door system via the unique “key lock” design provides a guaranteed seal without additional motors or compressors. CleanRane™ Air Spa System enhances the therapeutic and relaxing effects of bathing and provides a pleasant experience for the resident. 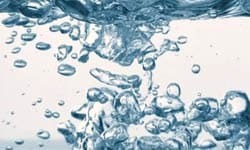 Hydromassage provides millions of preheated air bubbles in the water which increases stimulation of peripheral blood circulation, reduces pain and inflammation in the joints, gently massages away dirt, and induces deeper relaxation. 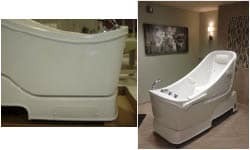 The RG9 Victoria and RJ15 Caribbean are both side-entry bathing systems, accessible through a swinging door located on the side of the tub. 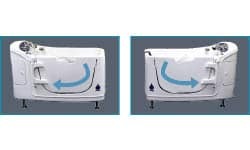 These bathing systems have the option of a left hand or right hand door swing. The plumbing package of the bathtub always follows the door hinge (or hand). When choosing between left-hand or right hand, you must consider the layout of your bathroom and toilet setup. Autofill is a timesaving feature available on the RR7-II Atlantic and the RS8 Geneva that allows caregivers to fill the tub to a preset level while completing other tasks or collecting the resident. 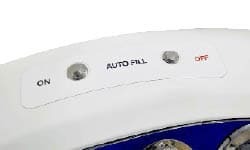 With the push of a button, the tub fills to a preset level (24 gallons for the RR7-II and 64 gallons for the RS8 models), eliminating waiting/observation time. Plumbing hookups are at the end of the tub where the control panel is located. Plumbing hookups are on the side of the tub opposite of the door. Allows for 360 ° unobstructed access for the caregiver, with no visible hoses or cords. (The plumbing hookups are under the tub). Rane’s lemon-scented is effective against H1N1 Influenza A virus, TB, MRSA, Hepatitis B/C, VISA, VRE, HIV-1, and pathogenic fungi. 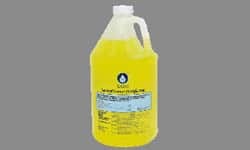 Concentrated for economical use, it disinfects and cleans at a dilution ratio of 2 oz. of disinfectant solution to 1-gallon of water. Rane Disinfectant Solution is available in four one-gallon bottles per case. 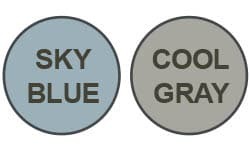 In addition to the traditional white, Rane Bathing Systems are available in Sky Blue or Cool Gray for an additional charge.